Successfully Added Fingerprint Time Attendance System with Stand to your Shopping Cart. Fingerprint Time Clock and Recorder to be used as a business clocking in/out system for employees. This digital fingerprint terminal records the attendance data of employees based on registered fingerprints. A biometric time management system to ensure your company gets an accurate record of employee attendance. The purpose of this device is to help employers and employees more easily record daily time worked. 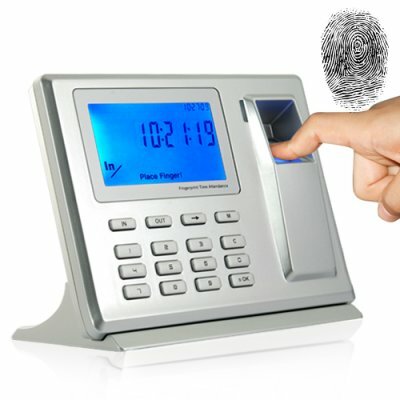 This fingerprint time attendance device helps companies to manage attendance records more easily while allowing for company hourly and contract workers to more quickly Punch IN/Punch OUT while also not having to rely on inconvenient ID card systems (you can forget or lose a card, but you can't forget your finger!). This fingerprint time attendance device is perfect for company HR Managers of any small or medium sized business. This device will work wonders in making your job easier while also making it possible to more closely monitor employee time, thereby saving your company money and time. It comes with software that lets you view employee attendance records, create different work-time shifts, set holidays, automatically create multiple attendance reports based on your query, set alarms for anomolous data, export the records to excel, and much more. When its time to retrieve the machine's stored data, simply connect it to a computer with the included USB data cable, and then you (the ADMIN) will have easy access to the machines stored attendance data. View every entry and exit along with individual and/or group attendance details anytime you like - daily, weekly, monthly, whatever. The provided software allows you to view a variety of recorded data such as; Employee History, Attendance Records per Dedicated Time Period, Group Scheduling Reports, Overtime Analysis, Early and Late Reports by Employee or Group, and many more. The included software is in English and can help you analyze the attendance data of 1 to 1500 employees. After spending a few hours getting to know the software, you will soon be able to fully analyze employee attendance data in ways you only dreamed of doing before. Catch that constantly late employee or reward the employee who always stays late to finish his job - the choice is yours, that is when you have the BG07 Fingerprint Time Attendance System! In stock in our warehouse right now, this is the perfect resale item to sell to your bigger clients or even install in your own office. Click "Add to Cart" now and we will express ship it out to you tomorrow! - Note (1): These are the primary software features. Each major category includes many more detailed functions that allows employee time and data management to be analyzed in standard and specialized ways. - Note (2): You should expect to spend approx 8-10 hours enrolling your employees and setting up the software before you get started using the CVKR-BG07. We also recommend you do a one-week test run of the product to make sure you and your employees get used to the function of the device before full implementation of the new attendance system. - Note (3): The device's software does not have a password set when you first receive it. Just type "admin" to begin using the software. Once you have set up the software on your computer we suggest you change the Administrator username and password. An even better system than what they use at The White House! Important Note for Hourly Employers: The cost of missed labor hours can be very high. Studies have shown that if you have 20 employees receiving pay for merely 4 minutes of "wasted" time per day (coming in late, leaving early, extended lunches, etc. ), that will total 1600 minutes per month. If your average pay rate is $12.00 per hour, then you pay an extra $320 each month for work that was never done. Add in any estimated employer contribution on government benefits and other taxes, then your annual cost is above $6000 for that empty time. The solution to removing this lost time is a Biometric Fingerprint Attendance Clock IN / Clock OUT System. Each employee fingerprint is unique and cannot be shared among employees. Do you know what Buddy Clocking is and how much it can cost your profitability? "Buddy-clocking" is when a co-worker clocks in or out for another employee. With text messaging and the widespread use of mobile phones, it is easy and convenient for an employee to text a co-worker and say "hey, can you clock in for me, I will 15 minutes late". Well, with a Biometric Fingerprint Time-Clock those days have come to an end! Now your company will be able to capture every minute of work you pay for! Yes, it is provided with a professional software application that keep tracks of everyone's entry and exit activity and allows you to store individual file records of each employee. With its 3D sensor it can accurately detect fingers and heat, which means it cannot be fooled by fingerprint pictures or photocopies. What's the userid and password to access administrative privileges on this unit? The userid and password can be found in the user manual, but here is it anyway; Userid is "admin", no quotes needed.